For Karl Barth’s mature theology, one must turn to the Church Dogmatics. Yet tackling the Church Dogmatics is more like undertaking a continental expedition than setting off for a weekend vacation. Therefore, even for those with minimal interest in the development of his thought or the history of 20th-century theology, it’s helpful to read some of Barth’s shorter works to obtain a sense of his writing style, modes of thinking, major themes, and chief concerns. So consider choosing one of the following shorter works to read first, to help you get your bearings before plunging into the Church Dogmatics. 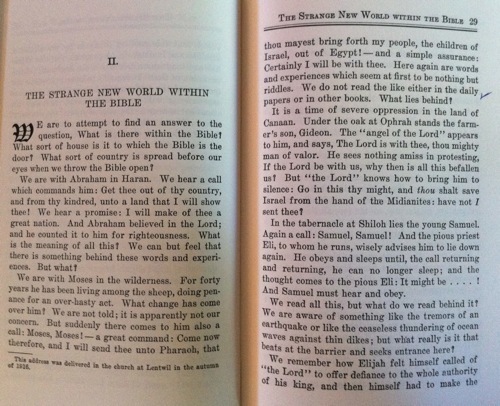 Karl Barth, “The Strange New World within the Bible” (1916), in Karl Barth, The Word of God and the Word of Man , trans. Douglas Horton (Gloucester, Mass. : Peter Smith, 1978), pp. 28-50. The Bible is like a mirror in which we see only ourselves and our little gods unless by God’s grace we dare to recognize the coming of the kingdom of God. Karl Barth, “The Humanity of God” (1956), in Karl Barth, The Humanity of God (Westminster John Knox Press, 1960), pp. 37-65. In part because Barth includes some reminiscences about changes in his thinking from his earlier writings, this is an excellent short essay to read first to get to know Barth. Karl Barth, “Evangelical Theology in the 19th Century” (1957), in Karl Barth, The Humanity of God (Louisville, KY: Westminster John Knox Press, 1960), pp. 11-33. Read this little essay to appreciate how Barth’s theology represented a rejection of 19th-century liberal theology. 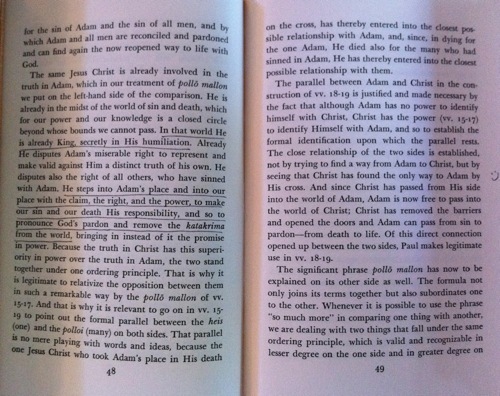 Karl Barth, Christ and Adam: Man and Humanity in Romans 5 (New York: Harper, 1957). Karl Barth, “The Proclamation of God’s Free Grace” (1947), in Karl Barth, God Here and Now (London and New York, Routledge, 2003), pp. 34-54. Karl Barth, “Gospel and Law,” in Karl Barth, Community, State, and Church (Gloucester, Mass. : Peter Smith, 1968 ), pp. 71-100. 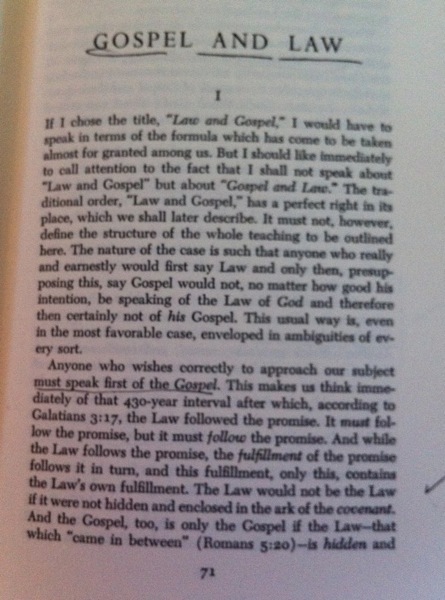 For Barth, grace is not an exception to law; rather, law can only be rightly understood within the framework of grace. Karl Barth, “To you is born this day a Saviour” (Christmas 1954), in Karl Barth, Deliverance to the Captives (London: SCM Press, 1961), pp. 20-27. To explore how any theologian has come to grips with the doctrine of grace, watch how he preaches to inmates – see my previous post on Columbo. While Professor of Theology at Basel University, Barth regularly preached to men and women in the Basel prison. Karl Barth, Anselm: Fides Quarens Intellectum (1960). Karl Barth, Nein! (1934); trans. “No! 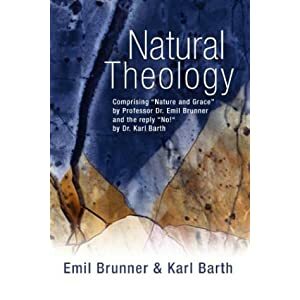 Answer to Emil Brunner,” in Emil Brunner and Karl Barth, Natural Theology , trans. Peter Fraenkel (Eugene, OR: Wipf and Stock Publishers, 2002), pp. 65-128. Although the Church Dogmatics has much to add about Barth’s theology of creation, this early essay is essential reading for those interested in the development of Barth’s views of nature and grace, natural theology, revelation and methodology, the implications of a theology of grace for epistemology, or Barth’s opposition to the theological premises of both Protestant scholasticism and Roman Catholicism.